The Smallworld™ Gas Distribution Office (GDO) and Smallworld Global Transmission Office (GTO), part of GE's software solution portfolio, are industry data models, applications and integration products. They effectively lower the cost of ownership for operators by eliminating the need to develop, test and maintain a complex suite of data management, analysis and industry specific applications. Regularly scheduled upgrades are straightforward, allowing companies to plan for and successfully incorporate upgrades to take advantage of future product enhancements. Smallworld Gas Distribution Office & Smallworld Global Transmission Office are market-leading solutions backed by the experience of more than 120 gas utilities worldwide that use Smallworld GIS. 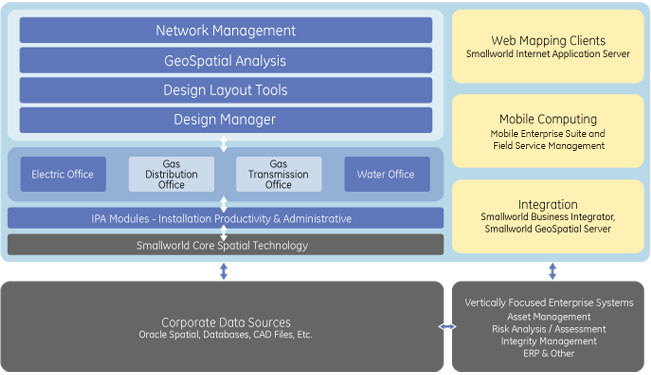 Smallworld Gas Distribution Office & Smallworld Global Transmission Office are a set of business applications used by the gas and pipeline operators to document, plan, operate and manage their networks. The Standard Global Data Models supply an industry tested and robust foundation for constructing and maintaining gas distribution and transmission networks, cathodic protection systems, and the substance for complete life cycle management of assets. These data models have been developed in conjunction with industry experts and provide a support base for the GDO and GTO environment, providing the required network connectivity, asset attribution, life cycle status, linear referencing and symbol definitions. 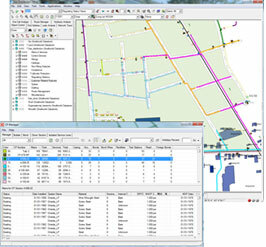 Anticipating the need for gas distribution and pipeline operators to manage unique combinations of facilities, the GDO and GTO data models can be extended according to documented procedures. Standard Approach: Modeling the standard properties of equipment but providing support to quickly and easily customize the model to their business needs. 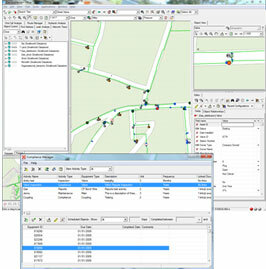 Network Types: Object geometries are mapped by a network type, enabling visualization and connectivity management. GTO provides network and cathodic system schematic worlds. Objects in Multiple Contexts: Objects can be placed anywhere in the network in different contexts. For example, fitting equipment can be placed in the geographic world, in the internal world of a compressor/regulator station and network and schematic worlds. Smallworld GDO and GTO are capable of supporting a wide range of data implementations, from generalized to extreme detail. The Standard Global Data Model is an all-new implementation encompassing regional legacy models and best practices. The GDO and GTO data models support the business processes built around best-in-class systems and serve to provide a data migration path that minimizes change management. Modeling Multiple Pressure Systems: Pressure systems are modeled from high to low pressure with the ability to visualize based on pressure, system, cathodic network, material, etc. and maintain network connectivity to support critical business processes such as outage analysis and pressure studies. Life Cycle Status Model: GDO and GTO allow defining a status for equipment/asset or facility. The status is a mandatory attribute for each asset and helps the application determine how the object is to be treated when the data is being displayed or used. Application Environment: GDO and GTO can exist in a single environment and application view or can be completely independent based on the operators business needs. GDO supports configurations for 3rd-party products, allowing customers to easily extend their solution to include key industry applications. Gas Distribution operators support many different and complex aspects of the gas distribution business to satisfy internal and external standards and regulatory issues. 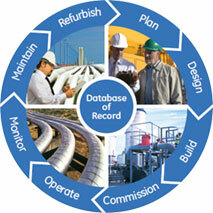 GDO is designed to be integrated into the engineering and operational business processes of gas distribution operators. GDO has 20 business applications that support the daily life cycle processes and tasks. The GDO base model includes fundamental applications such as Business Rules, Network Trace Manager, Dimensioning Tools, Work Flow Manager, Environmental Contaminants, and Common Office (IPA) productivity tools. GDO base provides a substantial foundation for all other applications that are available for GDO. Organizational Hierarchy models a virtual organization within the GDO spatial environment. Compliance Manger satisfies day to day inspection, maintenance and compliance programs. Public Awareness manages communications to the public about company activities and is API 1104 compliant. Cathodic Protection Manager models and manages Cathodic systems, readings, analysis and reporting functions. Protection & Safety Zones are used to manage encroachment of utility assets including gas mains and service lines. Compliance Manager and Associated Modules define and schedule your organization's compliance inspection activities to help ensure compliance and help identify remedial and maintenance requirements. Compliance Manager enables you to specify the types of objects that compliance activities target, track the progress of these activities, and schedule re-inspections, if necessary. Data Maintenance is a key process for gas distribution operators. The ability to maintain current, accurate, complete, traceable, high quality data is at the root of support for all other processes. GDO supports the data maintenance processes, utilizing a variety of different tools to easily maintain asset data, load asset and GPS data, maintain quality, and manage extremely large amounts of related data, all driving towards reducing data maintenance costs through integrated business processes and automated tools. 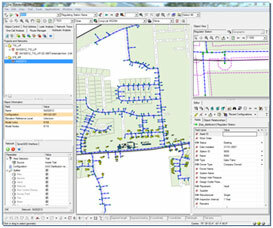 Survey Points Manager Is used to import survey points from Comma Separated Value (CSV) files, and to use that data to create and manage centerline geometries (for example, pipe segments) and point objects (for example, valves). When a new section of pipeline is laid, or the GIS positioning of pipeline components is suspect, the absolute positioning of all objects can be found by carrying out a survey. 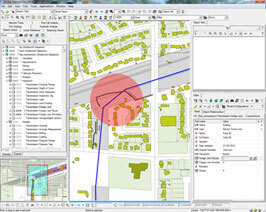 The digital survey data can then be imported into your Smallworld Office Suite application and converted into geometry using Survey Points Manager. Soils Data Loader specifies an aggregation range that defines the depth of the soil data you want to import (where Range from 0 = surface, and Range to n = depth underground, in Measure Units). For example, if you know that the proposed pipeline depth is 2 meters, you could import soil data from 1.5 to 2.5 meters. The Soil Data Loader analyzes three types of soil data within this depth range: soil type, water content, and pH. GDO-GTO Synchronization Plugin is configured to synchronize transmission class distribution assets to GTO to support the in-depth risk and integrity management studies required by PHMSA. This is a single direction synchronization but allows for the complete management of these transmission class assets (promotion and de-motion of assets) throughout their life cycle. Service Line Hierarchy is used for pipes that connect the gas main with the demand points or meters at the customer or household. Services are often constructed from a number of pipes that may have different materials or diameters and may be brought in at different times. It is common practice to build service stubs from the main to the curb and later connect them with the demand points. Different asset components make up the entire service line hierarchy, which is the entire connection of the service line from main to demand point. There are different and unique requirements on inspection cycles, regulatory scrutiny and risk assessment for the service line hierarchies. The analysis applications provide the operator with direct access to information to support daily business processes. They are used to support emergency and non-emergency situations, risk analysis, work planning, routing, and calculations. 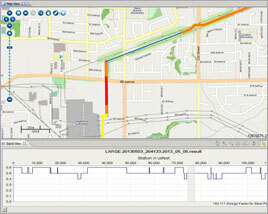 Gas Outage Analysis provides the operator with tools to preform planned and unplanned outage analysis scenarios. These scenarios can be saved and recalled, customers impacted by an outage are identified, and shut-in plans can be analyzed and refined. Analyze the gas distribution network around the potential work site to trace which valves need to be closed and which customers it will affect. Manage all the outage tasks that need to be carried out (helping to ensure that the gas can be shut off and turned on again as safely as possible). Generate reports with snapshots of the locations and addresses of affected customers, and export them and distribute them by e-mail. One Call Analysis can import and geocode One-Call tickets (Call Before You Dig) then utilizing different analysis queries results can show specific types of tickets, open or closed tickets, clustering of tickets near assets, etc. These results can be used in several different business processes such as Risk Analysis, third party damage collections and survey patrol. Leak Analysis allows the user to manage leak information, query leak information and provide to the user the data to help perform assessments on their assets. A complete leak history is maintained in GDO and the analysis results are used to support several business processes. These may include inspection and maintenance activities, risk analysis, leak management, and Cathodic protection management. Route Manager provides the GDO user with powerful tools to manage work events that require routing and routing management. Use Route Manager to help to plan these activities, especially where a number of the same type of visits are made in one day or shift. These activities are typically related by asset type and by their similar natures. Plan pipe: the dimensioning of short pieces of planned pipe that will extend your network (for example, the flow, diameter, inlet pressure or outlet pressure of the planned service line). Trace pipe: the calculation of inlet pressure, outlet pressure or flow along the shortest path found along the traced network pipes. 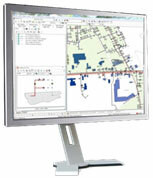 Create independent hydraulic calculation projects. Generate one or more link-node calculation networks for each project, starting from the registered source network. Optimize calculation networks for network calculations. Export a generated calculation network, either completely or partially, to a specific hydraulic calculation package. Organize your projects, networks and exports in a comprehensive tree structure. GE's Smallworld Global Transmission Office provides operators with a powerful and comprehensive fit-for-purpose pipeline data model, a set of geospatial business applications, integrity management and analysis tools that are designed to integrate with existing operators' business processes. Our unique approach of pre-configured and pre-integrated spatial solution is a key benefit for operators. GTO is a proven scalable solution that supports small to very large operators with large geographic territories. GTO's approach to implementation allows for significant reduction in implementation time compared to traditional customized solutions. Using this solution has proven to reduce implementation time and provide a faster return on investment by allowing users to perform their daily business processes more efficiently. 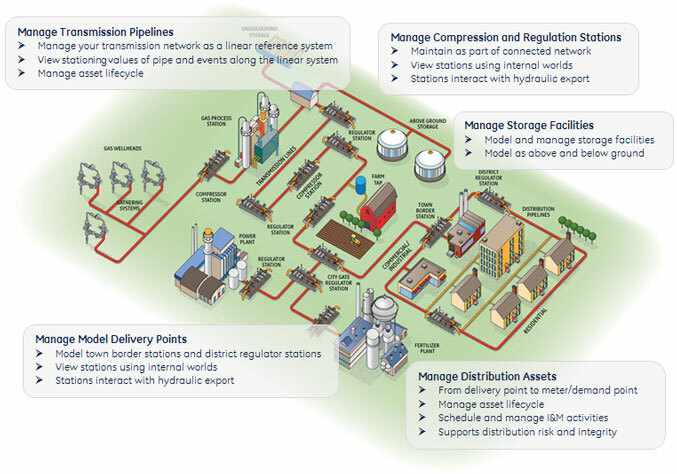 Maintain and manage complete and complex spatial asset networks throughout the pipeline asset life cycle, since the applications are integrated into the operator's business processes. Experience a single user environment that has 22+ business, analysis, data quality, and user productivity tools to support engineering, asset management and operational business processes. Enable standardization utilizing an industry data model that supports fundamental pipeline operations and integrity work processes. Improve productivity for risk and integrity management. 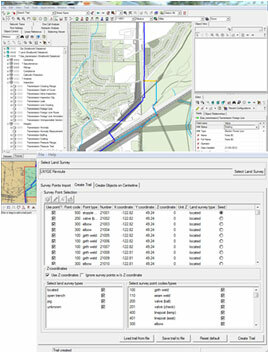 Survey Points Manager is used to import survey points from Comma Separated Value (CSV) files, and to use that data to create and manage centerline geometries (for example, pipe segments) and point objects (for example, valves). When a new section of pipeline is laid, or the GIS positioning of pipeline components is suspect, the absolute positioning of objects can be found by carrying out a survey. 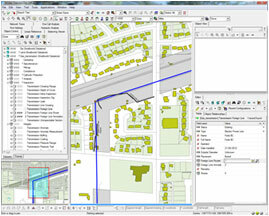 The digital survey data can then be imported into your Smallworld Office Suite application and converted into geometry using Survey Points Manager. Reroute and Repair Manager When a piece of pipeline is replaced or moved, and when old pipe is decommissioned or removed, use the GTO Pipe Reroute/Repair tools for the essential task of maintaining your organization's network asset data integrity. This data integrity is not only about the correct status or attributes of a pipe segment, but also about the topological interactions between the centerlines of old and new pipeline sections. The Pipe Reroute/Repair tools enable the efficient and successful execution of tasks necessary for a number of scenarios typical to the data needs of pipe rerouting and pipe repair workflows. Centerline Adjustment Tool Centerlines are digitized from various sources and are not always accurate. Updating the data can become quite a complex operation, especially if the section you want to adjust spans many pipe segments. The data as stored in your Smallworld Office product is not correct. The operator has gained better knowledge of the centerline route (from surveying). The pipeline has shifted (for example, offshore line, and earthquake or slope movement). Data Alignment Tool is used to align, geographically, linearly referenced inspection data along a centerline. 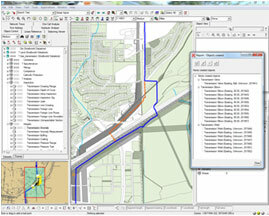 The alignment process is necessary to put the inspection data into the right context with the asset information on the map. It also helps you to establish the correct Line/Loop joins and station values for anomalies and CIS Readings. The Alignment Tool enables you to manipulate inspection data, such as from close interval, above ground CP Inspections (CIS, CIPS, DCVG etc. ), and intelligent pig runs from Inline Inspections (ILI). 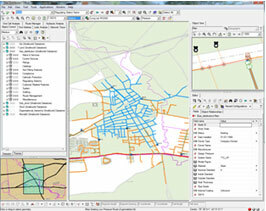 The Alignment Tool includes mechanisms for manipulating complex data that are streamlined for bulk operations. These operations are focused on the import of data, and on the calculation of location geometries, for many objects at a time. NPMS Exporter is used to transform and export the representation of the pipeline network in GTO into the network systems gathered by the NPMS. Cathodic Protection Manager GTO Cathodic Protection Manager, in conjunction with your existing cathodic protection (CP) database, manages your CP circuits and related assets, and maintains and enhances your CP system data. For example, you can create and merge objects representing cathodically protected sections of network to update your data, or you can view CP readings history graphs in different formats. Critical Angle Identifier Vertical bends in pipelines cause vertical deflection of the transported medium and pressure changes. The medium (especially natural gas) can be 'wet' and with rising pressure, water may condense at places where the pressure is highest (or where gas gets compressed). This usually happens when the pipe abruptly changes its direction upwards. The condensed water will then stay at the lowest point of the bend. 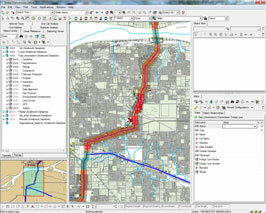 HCA Analysis Tools (Class Location & HCA) Use the High Consequence Area (HCA) Analysis application to create and manage the HCA Analysis data that is required by the authorities in certain countries (the Department of Transportation (DOT), for example, in the USA). You can create the HCA Analysis data by performing various types of analyses. PODS Synchronization Management GTO provides an optional module for interfacing an external PODS database. The PODS interface can be run as a scheduled batch process from a dedicated GTO image without user intervention. 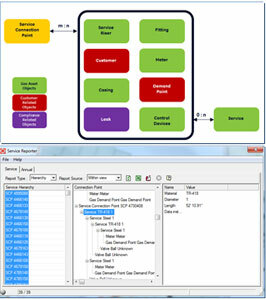 Only after the table mapping definitions are installed, the GTO and PODS tables can be synchronized. The Maximum Allowable Operating Pressure (MAOP) Calculator allows utilities to calculate the MAOP for a line loop in accordance with 49 CFR 192 (US Code of Federal Regulations) for steel transmission pipelines for natural gas in a verifiable, traceable and complete method. 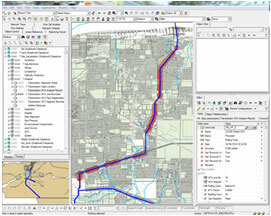 This calculator fundamentally integrates the calculation of the MAOP with your current GIS which allows for ease of reporting by creating a living analysis of the current and future system design. 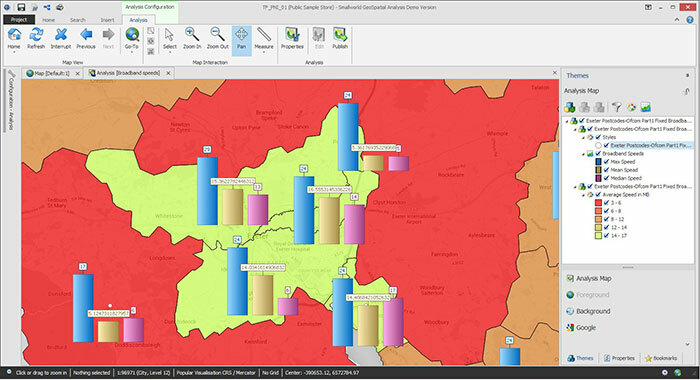 Geospatial data forms the foundation of critical business processes. Smallworld 5 extends the reach of geospatial data across the organization and its user communities through solutions enabling users to utilize and work with data anytime, anywhere. Smallworld has provided focused solutions to utilities and telecommunication operators for 25 years, continuously delivering new benefits and cost savings while scaling to support the needs of the world’s largest organizations. What is changing with the release of Smallworld 5? Driving Utility and Telecom Operator process efficiency across the enterprise through access to geospatial and asset data anytime, anywhere.